The weather is turning colder every day and more shoveling is on the way for homeowners. But there is another option. At Ridgewood Villa in Glenwood, all the shoveling is taken care of, along with just about everything else. Plus, the Villa has a long list of perks – including being just 50 feet from Glacial Ridge Health System – that make it the perfect spot for those looking for worry-free living. Tenants move to Ridgewood Villa for a variety of reasons. Some are looking for less maintenance. Some want to make their life easier. Some are looking for more social opportunities. And some want to live closer to the hospital and other services. For Bob and Lucy Bymers, all those things contributed to their decision to move into Ridgewood Villa. Bob had suffered a massive stroke and was slowly recovering, and Lucy’s eyesight was failing. Something needed to change. “It was getting harder and harder to keep up living in our house,” said Lucy. The Bymers both worked for Glenwood Retirement Village for many years. She served as the director of nursing for years and he worked in maintenance. They had friends at Ridgewood Villa and had always considered it a possible destination. When they decided to move, the transition was quick and easy, they said. They had plenty of help getting moved in and they were welcomed with open arms by the other tenants. “Everyone really looks out for each other here,” said Lucy. Ridgewood Villa is also located within a few blocks of Lake Minnewaska, city park, multiple restaurants, the library, downtown shops, and the grocery store. “We can go pretty much everywhere we want,” said Lucy. “And Rainbow Rider can take us places if we want, too,” said Bob. Since it is an independent living facility, residents come and go when they please. “One of our residents is a semi-retired farmer. He works on his farm every day when he can,” said Klous. “He doesn’t have to shop for his food; he doesn’t have to prepare the food or clean up afterward. It works out really well for him.” Klous said there is no requirement to check in or check out, and many of the tenants really enjoy that freedom. While many travel around to different venues for entertainment, there is also quite of bit of entertainment and fun right at Ridgewood Villa. “We have singers come in, we play bingo and cards, we have a bible study,” said Lucy. “We have different parties. We have a party on New Year’s Eve, there are many performances around the holidays, we have BBQs, Mexican theme parties with Mexican food and decorations, we dress up for the Twins or Vikings games, all sorts of stuff. We really have the best time here.” One of the Bymers’ favorite visitors are the elementary students from Minnewaska Elementary School. “They are all so nice,” she said. “We offer breakfast five days a week and a noon meal 365 days a year,” said Klous. “We also added an evening meal service, along with care packages that tenants can choose. 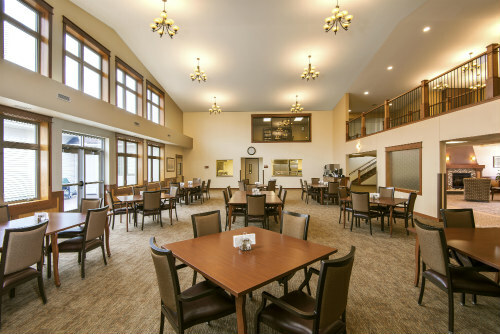 Ridgewood Villa offers restaurant-style dining and they have a dietician and dietary staff that they share with the hospital. “The staff look after any dietary needs or restrictions that the tenants may have. And if a resident isn’t feeling well, they will save a meal for them and bring it right to their room.” For many tenants at Ridgewood Villa, the meals are an improvement in their diet, which contributes to their overall health. The addition of the new Glacial Ridge Wellness Center that is open to the public means all tenants at Ridgewood Villa can enjoy the convenience of the wellness center, as well as the services of both physical and occupational therapy, just steps away. All tenants have a discounted membership to the wellness center and its services. “It is really nice for the residents to just walk down the hall for these services,” said Klous. If tenants walk the other direction, they will find themselves at Trumm Drug, a full-service pharmacy and retail store, which is leasing space in the Ridgewood Villa complex. Fifty-feet further, just across the avenue, is the entrance to the hospital and clinic. Klous said Ridgewood Villa is set up nicely for residents to live comfortably for a long time. If and when additional assistance is needed (homecare, housekeeping, grocery delivery, etc. ), they can get other services. With the services available on-site, and medical services available next door, “They can truly age in place here,” said Klous. If you are interested in a tour of Ridgewood Villa, call Daryl at 320-634-2261 or email Daryl.klous@glacialridge.org.